Welcome back or welcome for the first! Today I’m showing off my gem’ of a find from Le Chateau. These BOOTS though. I usually don’t shop at Le Chateau, but decided to stop by their website in my desperate search for leather booties. I was beyond satisfied with this find. I always thought Le Chateau to be a workwear warehouse, but was excited to see a store revamp from the one I walked out of in 2008 when after buying my prom dress. One thing I must say about pointed toe booties, is that they are not true to size. They’re very narrow above your toes and can cause some discomfort if not sized properly. Make sure to go up a whole size to ensure you are comfortable, but don’t sacrifice style. Sometimes going up a size comes with that clown shoe aesthetic, which you don’t want either. Find middle ground. I think it’s safe to say, Le Chateau will be a go to for my sartorial needs. Find my outfit details at the end of the post and thanks for reading ! 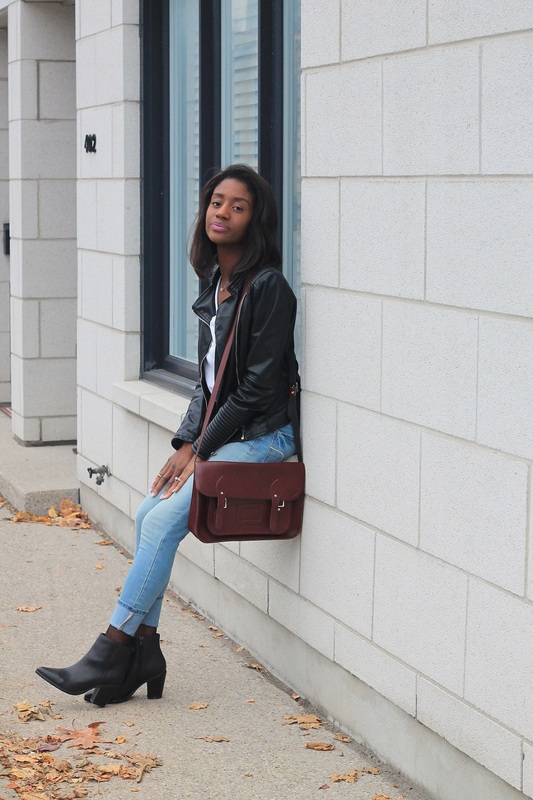 Jacket: Zara (Similar) || Shirt: H&M || Shoes: Le Chateau Booties || Necklace: Tiffany & Co || Jeans: American Eagle || Bag: Cambridge Satchel Co.